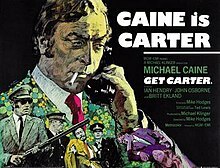 Tom Cox writes that many British filmmakers "have stolen from Hodges without matching the cold, realistic kick" of Carter. Films such as The Long Good Friday, Face and Lock, Stock and Two Smoking Barrels borrow from the Carter blueprint. Steven Soderbergh's 1999 film The Limey is a homage to Carter and other British gangster films, and contains similar plot elements and themes of revenge, family and corruption. Soderbergh said he envisioned The Limey as "Get Carter made by Alain Resnais". Shane Meadows' film Dead Man's Shoes has also drawn comparisons to Get Carter, being as it is a revenge gangster story set around a provincial English town.Phil Daniels considers Get Carter one of the greatest British films, ranking it as one of Caine's finest performances and describing it as a "mad, violent but hugely influential British gangster film without which there would never have been a Lock, Stock And Two Smoking Barrels". The film's music also enjoyed its own resurgence in popularity, as it tapped into a 1990s interest in vintage film soundtracks. Portishead's Adrian Utley explained that they found the music to Get Carter inspiring as "it was done quickly and cheaply with only a few instruments, and it had to be intensely creative to disguise its limitations".The Human League album Dare contains a track covering the Get Carter theme, although it was only a version of the sparse leitmotif that opens and closes the film as opposed to the full-blooded jazz piece that accompanies the train journey. Stereolab also covers Roy Budd's theme on their album Aluminum Tunes, although they call their version "Get Carter", as opposed to its proper title, "Main Theme (Carter Takes A Train)". This Stereolab version was subsequently used as a sample in the song "Got Carter" by 76. The Finnish rock band Laika & the Cosmonauts cover the film's theme on their 1995 album The Amazing Colossal Band. BB Davis & the Red Orchidstra released a version of the film's title theme in 1999. Jah Wobble produced a dub cover version of the theme tune in 2009. Wobble had long been a fan of the bassline of the track, saying in a 2004 interview with The Independent that "There are some bass lines that contain the whole mystery of creation within them".